September 30, 2014 - Georgetown, Massachusetts – UFP Technologies, a producer of innovative custom-engineered components, products, and specialty packaging has recently introduced a custom insulated shipping container to house the BioShell® Suspension Pack. The new insulated shipper solves the issue of temperature variations throughout the cold chain distribution process. UFP Technologies’ BioShell is a universal storage container which protects single use biopharmaceutical bags during storage, handling and shipping. The insulated shipper keeps frozen BioShells within an adequate temperature range during transportation. The contents within the shipper can be stored as low as -80°C. A critical step in the cold chain distribution process is ensuring that bulk drug shipments remain undamaged and within a specific temperature range during transportation. An increase in temperature throughout this transportation process could compromise the integrity of these temperature sensitive products, resulting in large potential loses for pharmaceutical companies. To mitigate these risks companies are relying on cold chain solutions that can provide impact protection and maintain low temperatures throughout the supply chain. UFP Technologies’ insulated shipper consists of an outer box containing high-performance insulation foam panels combined with specialty film. The combination of foam and film improves the insulating properties as well as providing a longer lasting, cleanable surface. 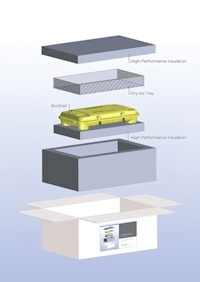 A tray containing dry ice or phase-change materials is added to the insulated shipper to achieve the proper temperatures during transport. UFP Technologies’ insulated shippers are customizable to meet customers’ transportation and temperature requirements. Numerous tests have been conducted on the BioShell and insulated shipper at UFP Technologies’ ISTA certified facilities to ensure quality and function of the design. 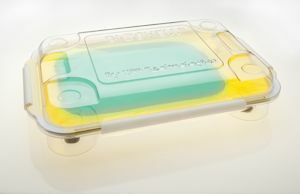 This includes simulated accidental drop tests at various temperatures to ensure that the contents within the BioShell container remain undamaged during extreme conditions. UFP Technologies will be showcasing the BioShell and insulated shipper along with other solutions for the biopharmaceutical industry at this year’s ISPE Boston Product Show, ISPE Annual Show and Interphex 2015. For more information visit www.bio-shell.com. BioShell® is a registered trademark of UFP Technologies, Inc.